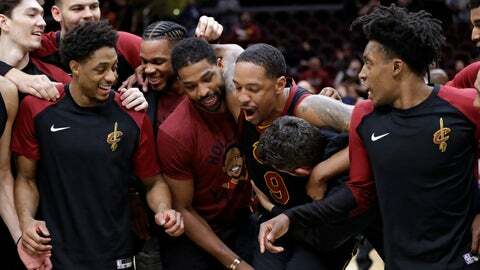 CLEVELAND (AP) — After handing out sneakers, signed balls and other gifts to fans, the Cleveland Cavaliers gathered one last time after the fourth-worst season in franchise history ended and took photos with adored teammate Channing Frye, whose retirement triggered a three-day celebration. Losing usually doesn’t look like this. Then, Drew, who doesn’t know if he himself will be back, offered thanks. And with that, an offseason of uncertainty and optimism began. Drew’s future is the first order of business for Cleveland, which finished 19-63 and ended its first season since LeBron James left for a second time on a 10-game losing streak. The 61-year-old Drew steered the team through countless injuries and other challenges while overseeing the development of point guard Collin Sexton, who didn’t miss a game and joined Larry Bird and Stephen Curry as the only rookies in NBA history to average at least 16 points while shooting better than 40% on 3-pointers and 80% from the foul line. Drew is expected to meet with general manager Koby Altman in the next few days to discuss what’s next. It’s possible the Cavaliers may already have another coach in mind to continue their rebuild, but Drew’s impact this season cannot be overlooked. He was handed a difficult situation that became worse when star forward Kevin Love underwent foot surgery in November, effectively ending any thought the Cavaliers entertained of competing for a playoff spot. But Drew never blinked, and the team followed his lead until the very end. “L.D. was outstanding,” said forward Larry Nance Jr., another of the season’s success stories. “That was not an easy position he got put into. Six games into the season — here are the reigns, figure it out. That’s exactly what he did. Got us on the right path. Would have been easy for him to mail it in, too, just because a year like this, this isn’t fun. So is Love, who played in only 22 games but came away feeling like the Cavaliers are headed in the right direction. And he thinks Drew has earned the chance to keep it going. Another possibility is Drew returning as an associate head coach, the role he accepted on Lue’s staff in 2016. But any new coach would have to be agreeable to working with Drew, whose presence could be divisive if the players take sides. The Cavaliers would like to resolve the coaching situation soon and devote their full attention to the draft in June, which could accelerate their return to relevance. Before that, though, there’s the lottery on May 14, when the random bounce of pingpong balls could change the fate of a team hoping to land Duke’s Zion Williamson, the consensus top college prospect. Cleveland finished tied with Phoenix for the league’s second-worst record behind New York. Those three teams will have a 14 percent chance of picking first, but depending on how things play out, there’s the possibility of falling as far as sixth and missing out on Williamson, his Duke teammate RJ Barrett or Ja Morant, Murray State’s electrifying guard who already has the Cavaliers’ attention. Hope seemed lost for the Cavaliers when James bolted last summer, devastating a team — and city — he treated to a title and four straight Finals appearances. But despite starting over, and despite untold injuries, Cleveland emerged from a rough season excited about the future.